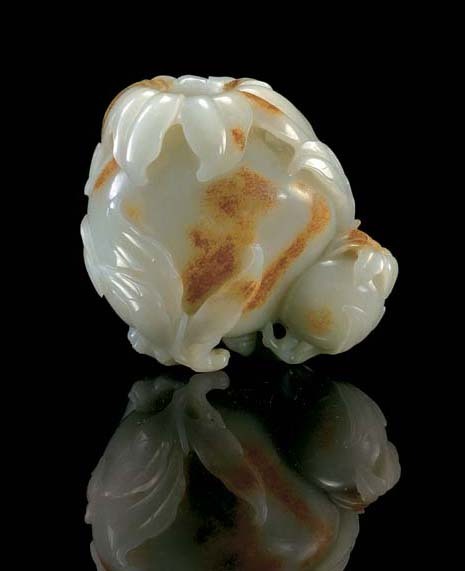 The Qing dynasty jade carvers were most adept at creating functional vessels out of otherwise decorative objects. As Robert Kleiner has pointed out in the catalogue description to the present lot, op. cit., p. 130, "This piece is skilfully designed for its function, with the incurved sides of the interior combining with a narrow opening to regulate the flow of water to single droplets, which are then dispersed along the natural channels formed by the collar of leaves around the neck." Compare the current water-dropper with other vessels presented as fruit or plant-shaped carvings: a lotus-leaf form flower receptacle from the Qing court collection is illustrated in Jadeware (III), The Complete Collection of Treasures of the Palace Museum, Hong Kong, 1995, pl. 50; a yellow jade vase shaped as a finger citron is also illustrated ibid., pl. 52; from the Hartman Collection, are a water-coupe carved as a cluster of peaches, illustrated op. cit., no. 102; and another water-dropper in the form of a lotus pod, lot 1408 in the present sale. The pomegranate, with its many seeds, is symbolic of having many children.